Sugar, citrus, spices and heat transform wine into a warming winter beverage. 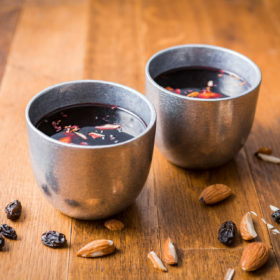 Find out the history behind mulled wine and get a recipe to make it at home. For many Americans, to heat up wine may seem like sacrilege. 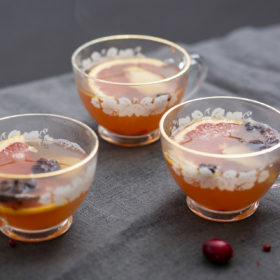 However, the process of mulling—adding sugar, spices and fruit to a heated drink—is one of the oldest cocktail techniques in the world. Records of mulled wine date back to 300 B.C. 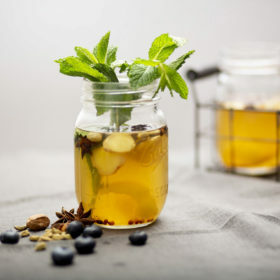 and the Egyptians, who dubbed their creation the “elixir of the afterlife.” Greek philosopher Hippocrates was said to prescribe spiced wine as a medicinal tonic, as did Pliny the Elder much later during Roman times. As the Romans traveled north, so did their penchant for mulled wine. One of the countries with deep cultural ties to mulled wine is Great Britain, with mentions of the drink popping up in medieval cookbooks. The heat and spices helped cover up the astringency of poorly made, oxidized wine, and for a time was considered healthier than the drinking water. Bordeaux’s clarets were the base wine of choice, according to 16th-century references books. A version of mulled wine, called “Smoking Bishop,” is mentioned in the Charles Dickens novel, A Christmas Carol. Today, giant crock pots are set atop the bars of a large number of pubs in Britain, and few families would let Christmas Day pass without a pot of wine mulling on the stove. In the U.S., mulled wine has not enjoyed the same widespread popularity as elsewhere. However, mulled wine can be found increasingly at bars and restaurants in cold-weather states and on holiday dinner tables. Jason Zuliani, co-owner of Dedalus Wines in Burlington, Vermont, explains his relationship to mulled wine, as well as ordering tips for the best wines to use as the drink’s base. For Natasha David, owner of the New York City cocktail bar Nitecap, mulled wine warms her heart as well as her belly. “I had a woman call in October to see if it had hit the menu yet. It gets so cold in Minneapolis in the winter months that [mulled wine] is a perfect warming drink,” McCabe-Johnston recently said on a day when the temperature was -13°F.